Whether you prepare these for Easter, or serve them throughout the year, Hot Cross Buns are best enjoyed with soft butter and your favourite jam. Step 1: Bring 2 cups of water to boil. In medium size, microwave-safe bowl, pour boiling water over tea bags. Allow tea to steep 5 minutes. Remove tea bags and add dried currants to tea. Place bowl of tea and currants in microwave, and microwave on high for 2 minutes. Set aside to cool. Step 2: In small saucepan, bring butter, milk, and salt to gentle simmer over low heat. When butter is half-melted, turn heating element off. Butter will continue to melt while the mixture starts to cool. Set aside when butter is fully melted. Step 3: Into bowl of your electric mixer, sift flour. Then add sugar, and yeast. Attach dough hook. Step 4: When milk mixture is just warm to the touch, not hot, turn the mixer to low-speed and stream milk into flour. Keep mixer on low-speed. 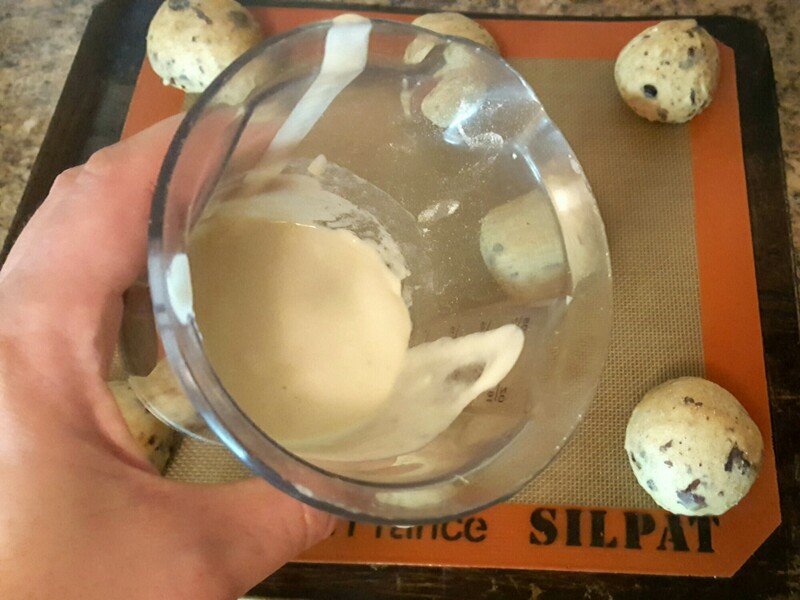 Add egg before milk and flour have blended together. Bring dough together by slightly increasing the speed. The liquid in the centre will pull the dry ingredients in from the sides, until you have one cohesive dough. If dough is slack and resembles a ‘batter’ or thick paste, it needs more flour. Reduce the speed and continue adding large pinches of bread flour, increasing the speed after every addition, until flour is fully incorporated. (When you increase the speed and notice the dough begins to pull away from the sides of the bowl, maintain that speed and wait to see if the dough pulls everything from the sides and bottom of the bowl. If it does, you don’t need to add more pinches of flour). The dough should be shiny, slightly sticky, but not slack. Knead for an additional 5 minutes on low-medium speed. Step 5: Set bowl with dough aside in warm room, covered with a tea towel, to double in size (approx. 1 hr). Step 6: Strain currants from tea into a sieve and press to release as much liquid as possible. (You want to add plump and juicy currants to the dough; not the liquid they were soaking in). 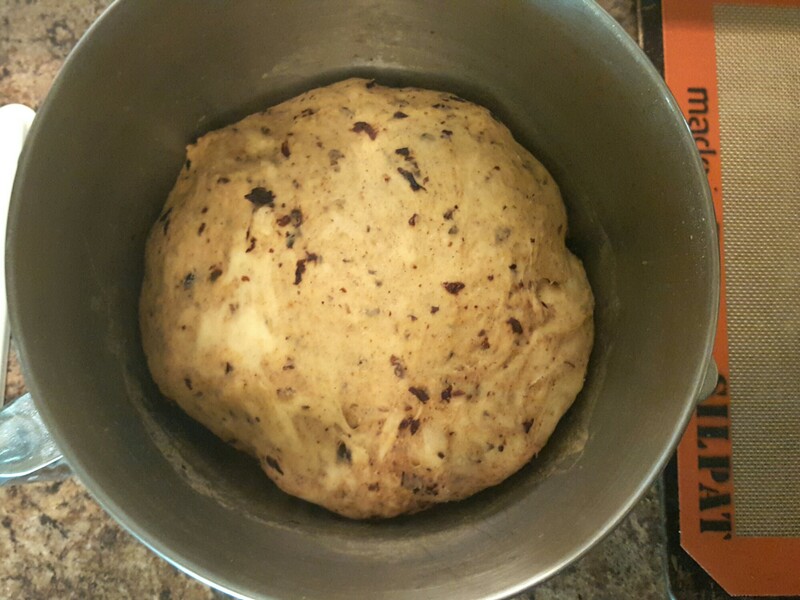 Step 7: After the hour rise, when dough has doubled in size, add drained currants, orange zest, apples, and cinnamon to dough. Knead with the dough hook on low-medium speed until all ingredients have been incorporated. With mixer running, add as many pinches of bread flour as necessary to get a nice dough consistency that no longer looks soggy. (Sticky is fine), Again you want a cohesive dough. Once desired consistency has been achieved, turn off mixer and set bowl of dough aside to rise an additional hour; covered with a tea towel. Step 8: Arrange baking rack to upper 1/3 of oven. Set oven to 400 °F/200°C (10° less if convection). Prepare two baking trays by lining them with silicone baking mats, and set them aside. 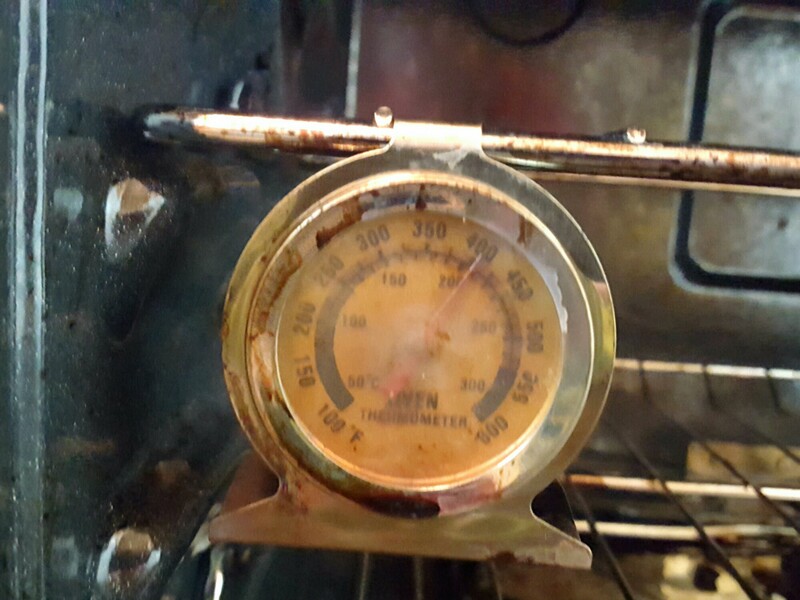 (I have an oven thermometer on the inside of my oven that confirms the oven is indeed at the right temperature. As these buns can easily burn, especially on the undersides, it is important your oven be at the correct temperature). Step 9: Ensure you have a clean dry work surface. Gently punch dough down in mixing bowl and place dough on work surface. Step 10: Divide dough into 50g portions. Shape each portion into spheres. 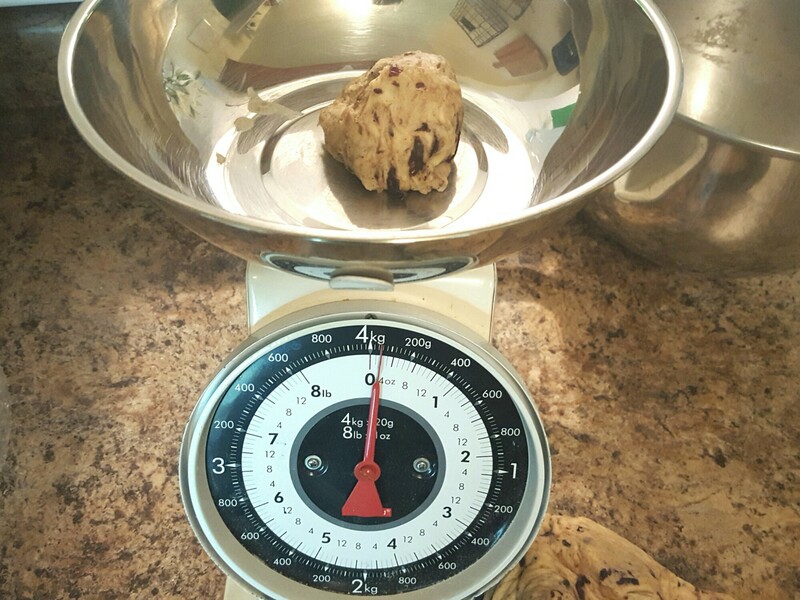 (Pick up portioned dough, place it on work surface. Cup dominant hand over dough portion and start rapidly tracing an invisible circle by rotating your cupped hand clockwise; with dough trapped inside). This forms a perfect ball. 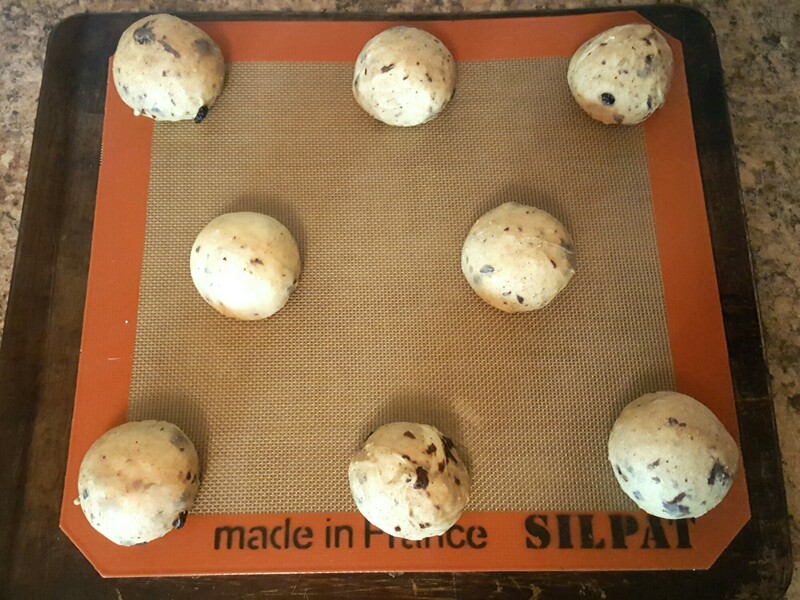 Step 11: Arrange dough balls on to silicone lined baking sheets, with enough space to expand while baking. Cover loosely with plastic wrap and set aside to rise 30 minutes. Step 12: In small container, mix all-purpose flour with enough water to form a sticky paste you can pipe onto the buns. (Handheld electric blenders work very well for blending flour and water smoothly). When you have a smooth paste, set aside. Step 13: In small saucepan, bring apricot jam to gentle simmer with ¼ cup of water over medium heat. Whisk to blend water and jam. When jam is nice and runny, turn off heat. Step 14: Prepare and bake trays one at a time! If you bake both trays at the same time, the lower tray is likely to burn. Discard plastic film from one tray of buns. 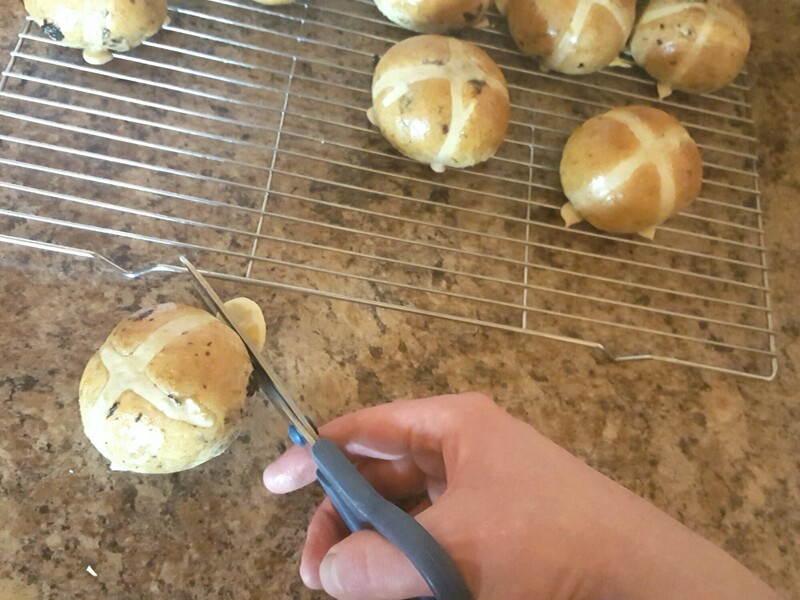 Using a piping bag with a fine tip, or a resealable plastic bag with a tiny corner cut off; pipe crosses onto the surface of each bun on that tray. Step 15: Place prepared tray of buns on rack in upper 1/3 of oven. Set timer for 8 minutes. At the 8 minute mark, rotate the baking tray. Bake for another 4-6 minutes (12-14 minutes total baking time). 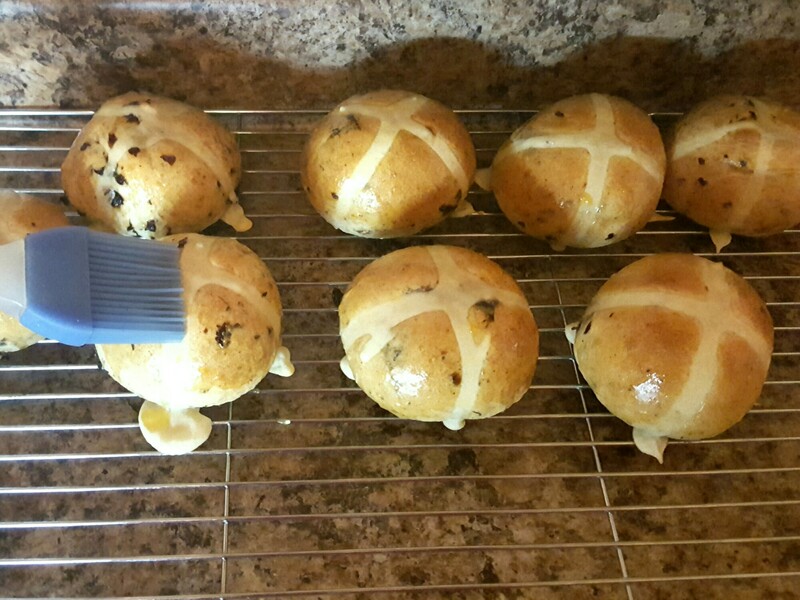 Keep a close eye on the buns, and remove them when they are golden between the crosses. (See image below). Step 16: Immediately glaze first tray with still warm apricot jam and allow to cool. Step 17: Discard film from second tray. Repeat piping and baking process with second tray; followed by glazing. Snip off uneven edges when all buns have cooled. Step 18: Allow buns to cool before serving. If you plan on freezing hot cross buns, allow them to cool to room temperature, before freezing in a resealable freezer bag. Re-heat them in the microwave for 30-60 seconds before serving. 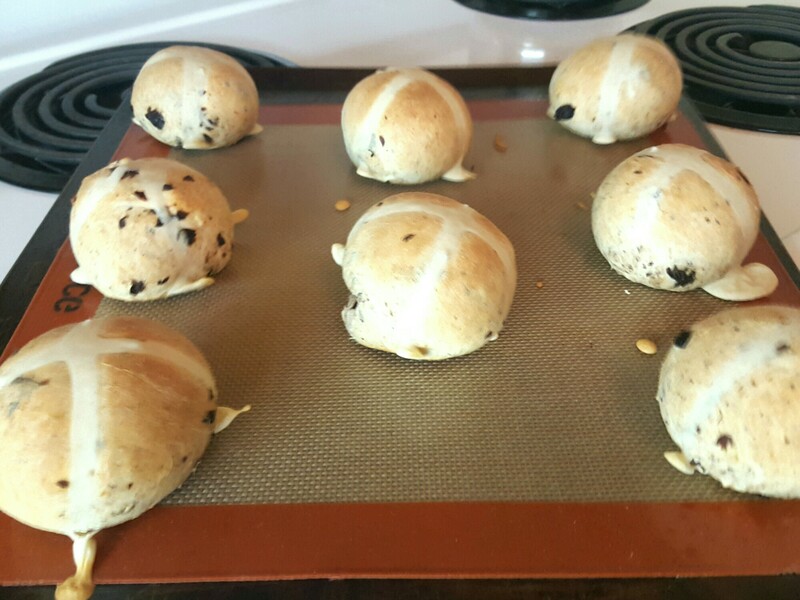 Tags: Easter Recipes, Hot Cross Buns, Sweet Buns. Bookmark the permalink.